The ESI-50L supports up to 32 digital stations, eight analog stations, and 16 trunks, and its system capabilities include full auto attendant, service observe, and three-digit flexible numbering. 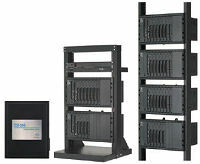 The ESI-50 Communications Server boasts the full set of ESI Communications Server features in a compact system. With capacity for up to 32 digital and 12 IP stations and 35 trunks (including PRI), the ESI-50 offers Resellers a feature-rich system perfect for small businesses. The main cabinet on the ESI-50 includes a built-in 482 port card and IVC hardware, along with one expansion slot for another 482 card. 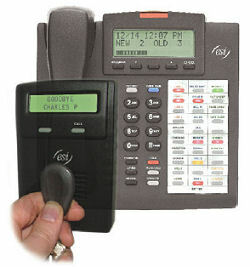 Simply activate the IVC to add IP phones and/or Esi-Link licenses. A new DLC82 port card also is available; it includes PRI support, eight digital ports, and two analog ports. For the voice mail, there are two options (both CompactFlash): six-port/15-hour, and six-port/60-hour. this compact system comes with 8-port/140-hour voice mail, and supports up to 84 digital and/or IP stations and T1/PRI. It’s perfect for a single-site business or one of up to 100 sites in an Esi-Link network. Customers needing a small and powerful phone system with all the capabilities of a larger organization can’t miss with the ESI-200. Targeted at small-to-medium-sized businesses with a total combination of 190 digital and/or IP stations, this system has two standard voice mail configurations: 16-port/140-hour and 24-port/600-hour. ESI-600 remains a top choice for large offices and multi-site customers. Supporting up to 408 digital and/or IP stations, the ESI-600 comes with 32 port/1,200 hour voice mail. The ESI-1000 comes standard with a Mirrored Memory Module (M3) for data redundancy and 128-port/1,200-hour voice mail. With a combined total of 816 digital and/or IP stations, the ESI-1000 can handle the needs of large businesses and enterprises. Call to find out how your phone system can provide services such as video camera control, remote access, badged entry and even Time and attendance!